At the advice of Marc ( and many others ) i brought the head to the machine shop in rochester. The friend who brought it down to them just called me to tell me that the head is cracked. I didnt have time to get all the details, but I am wondering if that cracking could have been causing what seemed to be blow-by...I will call tomorrow to find out more details on exactly what is wrong with the head and on which cylinders. audios wrote: At the advice of Marc ( and many others ) i brought the head to the machine shop in rochester. The friend who brought it down to them just called me to tell me that the head is cracked. I didnt have time to get all the details, but I am wondering if that cracking could have been causing what seemed to be blow-by...I will call tomorrow to find out more details on exactly what is wrong with the head and on which cylinders. I'm curious to know as well.... and where the crack is? Yeah, like the crack they all have between the valve seats. do you think that the head could be good still? this is the shop Marc sends all his heads to.... ill definately be bringing it back home to take a look when this is all over. Or the somewhat typical crack by the spark plugs. audios wrote: do you think that the head could be good still? this is the shop Marc sends all his heads to.... ill definately be bringing it back home to take a look when this is all over. Have them show you the crack, if it's just between the valve seats then it's not too much of a worry. If they know the heads, then they are probably talking about a different crack. Re: Bill's 200 20v,head crack evaluation?? Got the head back today, here is a photo of the crack. Anything to be concerned about? Bill's 200 20v,head crack evaluation?? I think thats a pretty normal 20vt crack to me. I would run it, thats just me. dana wrote: I think thats a pretty normal 20vt crack to me. I would run it, thats just me. I'm thinking I should put some valve guides in before I throw it back together? What about reusing a head gasket spacer? Definitely go guides and seals, I never did them. I'd go new HG too, but have heard some people reuse them a bit. That crack is within the Bentley spec, which (*I think) is no more than 3 threads. "When repairing cylinder heads, small cracks in the head between valve seats or valve seats and spark plug threads are permissible. 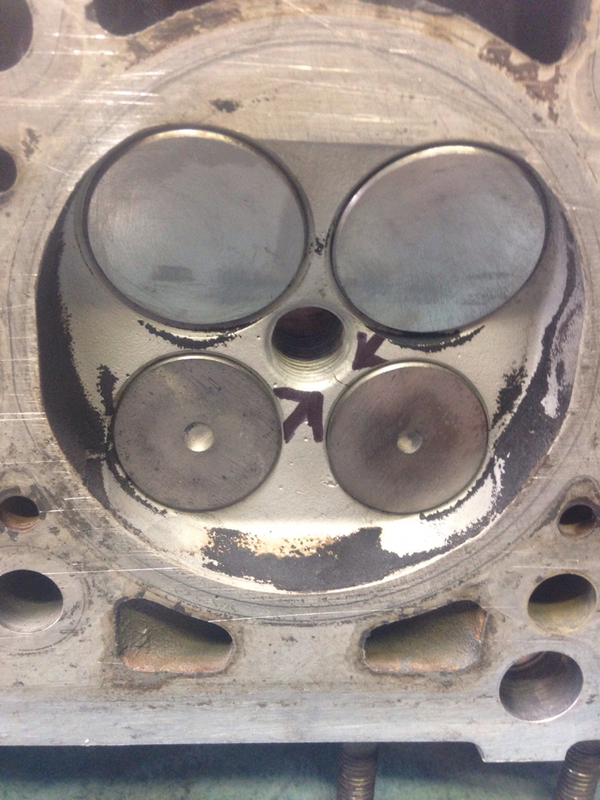 Cylinder heads showing such cracks can be reused without reducing engine service life or performance, providing cracks are small. Cracks may not be larger than 0.5mm (0.019") or cracks in spark plug threads may not be longer than through first coil of threads." when it refers to not being larger than .5mm is that the width or the length? Fix crack before reinstalling. Crack is not going to get smaller. Yes, head is going to crack in other combustion chambers in same areas. Buy unceacked head in near future. Just me. Good luck with project! finally got to start with piston #1 tonite. Here are some photos, does the bearing wear look normal? I noticed the top ring and the middle rings were almost on top of one another, could that have caused some of the blow by? Last edited by audios on Thu Oct 19, 2017 7:47 pm, edited 3 times in total. It's just that by nature all Photo Pics are private. the ring orientation is certainly not proper, but I think you have a catch can layout problem as well. I get that rings are supposed to be oriented correctly when installing, but what is to keep them from turning around in the bore once running? Two stroke rings cannot move because the ends of the ring would snag the ports in the cylinder walls, so they put a little pin in the groove to keep them aligned. I always just figured rings on a 4 stroke move around at will? ?